Responding to e-mail and forwarding messages on your iPhone works a lot like most other e-mail programs you’ve used. When you receive a message on your iPhone and want to reply to it, open the message and then tap the Reply/Reply All/Forward button, which looks like a curved arrow at the bottom of the screen. Then tap the Reply, Reply All, or Forward button. View the buttons for managing your e-mail. The Reply button creates a blank e-mail message addressed to the sender of the original message. The Reply All button creates a blank e-mail message addressed to the sender and all other recipients of the original message. In both cases, the subject is retained with a Re: prefix added. So if the original subject was iPhone Tips, the reply’s subject would be Re: iPhone Tips. 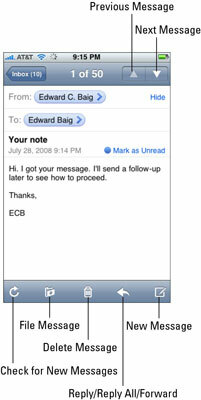 Tapping the Forward button creates an unaddressed e-mail message that contains the text of the original message. Add the e-mail address(es) of the person or people you want to forward the message to, and then tap Send. In this case, instead of a Re: prefix, the subject is preceded by Fwd:. So this time the subject would be Fwd: iPhone Tips. You can edit the subject line of a reply or a forwarded message or edit the body text of a forwarded message the same way you would edit any other text. It’s usually considered good form to leave the subject lines alone (with the Re: or Fwd: prefix intact), but there may be times when you want to change them. To send your reply or forwarded message, tap the Send button.